Jerusalem - Rabbi Yuval Sherlo is not impressed with the recent phenomenon of hundreds of businessmen discovering their ‘Jewish sparkle’ upon visiting tombs of righteous rabbis. Following the travel of millionaires and celebrities to a famous grave sites in Bulgaria with Rabbi Yoshiyahu Pinto, Rabbi Sherlo, a leading figure in the Religious-Zionist camp releases a short article in which he implies that the act amounts to idolatry. Sherlo also stated, “This trip requires nothing from them – not a change of devotion to halachic law, not conducting their businesses on the values of charity and law; they donate a certain sum to a righteous rabbi; they are forced to endure a flight for several hours and say prayers. That is all. Finally, an honest opinion to the crazy obsession of running to kevorim all over the world. As frum people we should know that we can open a siddur and daven to Hashem whenever and wherever we are. Christians believe that they need to daven to an intermediary. Of course, davening in a Mokom Kodesh is preferable, but unfortunately so people think that they need to daven to the Tzadik buried in the ground. The need some have to accuse other Jews of Idolatry every time they do something they don't approve of is an instinct I will never relate to. The underlying point is valid, in that it shouldn't be a replacement for following Halacha in other aspects of their lives. But perhaps it is a first step for them. Either way, say it is wrong, ok. Call it Idolatry? Seems very Halachicly questionable (the act of calling it that, of making such an accusation against Jews). I have been on many of such "pilgrimages" both as a Yochid and with a huge group. I can tell you 1st hand no one I know - No matter from what "type" -goes to a kever of a tzadik of the past Dor as a form of Idoltory! No one expects anything...we hope our tefilaos are mikuble....we pray and beg that the Tzadik should intercede on our behalf.... With the REBON KOL to whom we are ultimately praying!! WE maminin bnei maminin beleive it is Hakodosh Boruchu that answers our prayers (letov) we take it as a matter of Emunah as chazal says "Tazdikim bemeisosom yoser mechaiyhem" and as such have the ability to interceed. Indeed there are many anecdotal stories both in Europe and in Eretz Yisroel of people who have been "helped" after going to the kever of carious Tzadikim. Okay, now please rabbi we see this way of speaking to in the Torah ...kolav deed it as well. But it was a lomh time ago. Why can we be mispallel to a tzadik or a relative to ask then to ask the rebonoshel oylom for a ba-kasha.....do you agree? Was Yosef davening at Kever Rachel also a form of idolatry? Had the worshippers davened TO the Rebbe, this obscure religious zionist would have an argument. Instead this worshipper of the LAND OF ISRAEL opens his trap to offer opinions about things he knows nothing about. Just wondering who and how many he interviewed among those he disparages that makes him so certain that he knows the intent and result of all who chose to spend the asseress yamai tshuvah in the shade of kivrei tzaddikim. I especially question the timing of the release of this article during these days of rachomim when we would be better occupied with trembling over our own failings along with seeking to find vindication for our fellow Jews. Certainly he is entitled to express his opinion, especially to his family and talmidim, but couldn't he have exercised discretion and waited until some later date to divulge his opinion and disdain. Okay, now please rabbi we see this way of speaking to g_d the Torah ...kolav deed it as well. But it was a long time ago. According to the Rambam, it is assur to daven to anyone except for HaShem. How can anyone daven to a tzaddik that he intercede? If you don't believe that the tzaddik has the power to help your tefillos be miskabel by HKBH, then don't go. But it is disgusting in the week of slichos before RH to disparage people who with emunah shleimah go to a kever of an ish kodosh (at least in their eyes) and daven to Hashem feeling the the tzaddik can intercede for them in the heavenly realms. I never went to uman but when I hear people laugh at it, I get sick. 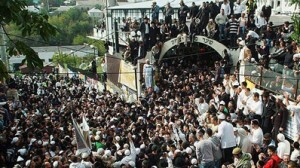 A place where 20,000 yidden get together to daven on RH is a mokom kodosh regardless of who is buried there. What gives any so-called leader the right to poke fun at the emunah of another yid? Is it jealousy? Loss of power? I got a feeling some his people are running to uman and it's eating him up. It's amazing to hear a "rabbi" who thinks medinas Yisroel (in its current manifestation) is the throne of Hashem on earth (among other interesting ideas he hold bshita) saying that visiting kivrei tzaddikim is avodah zarah. The poor man is confused. We should have rachmonus on him. We in NY have many tzaddikim right here. In EY there are many more, the avot and tanoim etc. We do not have to go to Europe and support those who would be thrilled to kill us again. And we do not daven to the tzaddik. We daven to Hashem in the zechut of the tzaddik. it's not davening to the tzadik;it's asking him to help you in your request to hashem.when moshe sent the meraglim to ey,kalaiv first went to the maharas hamachpaila to daven for the koach not to fall in with the meraglim and their plans and he was takeh succesful.kalaiv had to do his part as we all do but asking for the added help of zechus avos and tzadikim is a way to say i am small,i know it and i need the help of others far greater than i.
what's about Kolaiv running to Chevron to daven at the Kvorim there to avoid the Meraglim?? AGAIN we ask the Tzadik to intercede. The same way we go to a Tzadik that is alive for a Brocho. Are we making a living Godol or Rebbe into some for of G-d, R"L? OF Course Not!!! we are asking the Godol/Rebbe to intercede and be mispallel for us to help get our poor and simple tefilas a "hearing' if you will, before the "Keysei Hakovod" and as I stated above "Tazdikim bemeisosom yoser mechaiyhem" so there is a chance that our tefilos will be heard. In these days of Rachamim perhaps every yid has the ability to have his tefilos go up to Hashem.... but even now Tefliah b'Tzibur are "better" "carry more clout" then if you are mispallell alone! Similarly Tefilas said B'rabim at a Tzion Of a Great Tzadik has more potential to be merutzeh and mekubel . Why is this concept so hard to understand????!!!! Go to kevarim bef rosh hashoneh,but dont make it a habit there is a mekor somewhere not to go to kvorim to often. The issue is not C"V praying TO the Tzadik at his Kever. The issue is that we pray only to Hashem, that Hashem should please fulfill the prayer in the MERIT of the Tzadik. We hope that the Tzadik will be a Maylitz Yosher for those praying at his Kever. We all acknowledge that the only power in the universe is Hashem, and He is the only one that we pray to. “ AGAIN we ask the Tzadik to intercede. The same way we go to a Tzadik that is alive for a Brocho. Are we making a living Godol or Rebbe into some for of G-d, R"L? OF Course Not!!! we are asking the Godol/Rebbe to intercede and be mispallel for us to help get our poor and simple tefilas a "hearing' if you will, before the "Keysei Hakovod" and as I stated above "Tazdikim bemeisosom yoser mechaiyhem" so there is a chance that our tefilos will be heard. "Similarly Tefilas said B'rabim at a Tzion Of a Great Tzadik has more potential to be merutzeh and mekubel", how do you know? Furthermore, why not judge the Yiddin lkaf zchus, like Rabbi Levi Yitzchok Mibardichev and others who saw the goodness in the Jew and not the negative. It reminds me of the story of the wagon driver who's wagon was stuck in the mud, and while trying to get the wheel fixed, was saying tehillim baal peh. One negative individual sees this and says, feh! this is how you say tehillim, with mud up to your knees! You are desecrating the tehillim. A chossid sees and says, look at this yid! Simple wagon driver that he is, he nevertheless says tehillim, even in this difficult situation. Glass half empty, half full. I go for the half full side. And as we approach RH, we have enough mekatrigim, we dont need to create more. This comes up again and again. In Kitzur Shulchan Aruch Siman 128 it says that here is an inyan to go to kivrei tzaddikim on erev rosh hashana. It mentions 2 reasons. One is to ask the tzaddil to intercede on our behalf. The other is to Daven to Hashem in that holy place. These are 2 separate things that can be done in the same place but 1 at a time. Of course asking a tzaddik for parnassa health etc is wrong; that is confusing the 2 things. You can ask him to daven for you and/or Daven to Hashem in that holy place. “Was Yosef davening at Kever Rachel also a form of idolatry?" Better than vegas. His point is that kever hopping is not the same is avodas HaShem. Maybe visiting a kever of a tzaddik has a place as part of thorough torah and mitzvos. The problem seems to be that many feel that it is a magic method for success. This smacks of avoda zorah. The 'heiliger' Reb Reb Elimelech M'Lizensk said any of his future generations (up to 10) who will visit his tzion with a request that he will intercede on their behalf to hashem. During the Nazi conquest of Poland specifically when they entered the town of Lizensk some yidden tried to escape. Having nowhere to go they hid in the 'ohel' of the holy Reb Elimelech. But the Nazis ym"s caught up with them and scoffed at these poor yidden for hiding next to a dead mans grave. Out of 'rishus' they dug the grave up when they the holy 'tzirah' of the tzaddik they jumped into jeeps and took off. Everyone of those yidden survived. So there's definitely an inyan to visit the graves of tzaddikim. the issue is not a new one. whether or not one should or may daven at q'varim is discussed by rishonim. kayadua, the rambam was extremely against it. more recently, the gaon is quoted as having various objections to visiting cemeteries. It is assure to leave your family for yomtov to daven at a kever of a tzadik. Stay home, be a mensh, act like a husband and father and have your children daven with you at home. The expense is prohibitive..
"This is the way faith is perceived today. Some sort of a deal, which only requires visiting the tomb of a righteous one accompanied by a rabbi, for money, an inner feeling of something secret and hidden, involving media, culture and government, all wrapped up in a package of faith, mysticism and secret." Accompanied by rabbi? Money? Media? Culture and government? What in the world does all this have to do with davening by kivrei tzadikim? "Is this not avodah zora?" No. It is not. "...; they are forced to endure a flight for several hours and say prayers. That is all." That is all? Does anyone have any idea the power of prayers? I hope we all agree we are being mispallel to the One Above. We go to certain tzadikim for their help at pushing our tephilos thru. Chasidim (according to the misnagdim) push the envelope just a little - but they have a mesorah so why start? This idea of traveling is a little baffling but it has always been done. We have kevorim where you are "guaranteed" a shiduch, some for yiras shamayim and some for money. Why do people spend millions of dollars going to these kevarim and not the kosel is beyond me - but its their money and they feel they need the help. Got no issues there either. I do want to say that this candle lighting is probably way past the line and is prob avoda zara. I know you have a questionable source but the way it is done it is just like, lehavdil, our catholic friends. I am not referring to the yahrtzait lichts @ kevarim. The ones who know what I am talking about know of this shtus. When that began, gedolik started getting scared whenever something new arrived. So, when they find a new kever and ppl all flock to it - it raises lots of questions. No one ever had a problem going to the noam eliezer or reb nachman (though many prob feel that bresliv is avoda zara anyway). I think these new ones are the concern. The worst trick of the yetzer hara! When yidden do something right, which can bring you closer to Hashem, along comes someone that accuses that action of being wrong, idolatry no less! So yosef hatzadik, Kolev ben Yefuneh, and all the tzadikim from all generations were wrong. I see. In fact it sais, that the bnei gad and bnei reuvein wanted their part of Eretz Yisroel on the other side, because they wanted to be close to Moishe Rabbeinu's grave! As a matter of a fact, today being the Yahrtzeit of the holy Chafetz Chaim, I REFUSE to believe that a shomer torah Rabbi said such a thing. #11 is right. It is absolutely assur to beseech the dead. One may only pray for the repose of the dead such as Yizkor. Unfortunately Chassidim picked up the catholic practice of saint worship. The Torah describes this as an abomination. The Chassidim who leave Eretz Yisroel and their mishpuchas before Yom Tov to fly to Uman may be misguided. Why are they mevaze the Keveros of our Avos and Imaos in Maaras HaMachpelah? They could be donating thousands of shekel to tzedukah as well rather than pay it to airlines and gangsters in Ukarane. Sad so sad. Rethink the priorities. Visit our Avos ! Give more tzedakah to save the hungry and very very poor of Yisrael. Please !!!! What am I missing..these pilgrims who come to EY, Russia and Eastern Europe are tavelling to the graves of rabbonim and tzadikim who died hundreds of years ago...they cannot daven for moisiach any more. We can daven for moishiach and inovoke the zchus of these tzadidim but their davening days are over. EMUNAH!! very simple and at the same time very difficult to accept. I have Emunah in Hashem and his Torah! I have Emunah That there is a Mesorah started there - Moshe Rabbeniu A"H at Har Seinai! And Moshe Rabbeniu A'H To Yehosuah and to the Shivim Zekainim etc... all; the way down thru Chazal and all the rest of the Rabbeim till this very day! I have Emunah that Tzadikim have the ability to give us brochos and to be mispallel for us. I have Emunah that when Chazal said that ""Tazdikim bemeisosom yoser mechaiyhem" that that is the absolute truth! With our chadarim close to closing and people losing their jobs and homes, the idea that anyone spends money to fly around the world to visit a kever is really pretty corrupt. Do you think the Aybishter would prefer a gvir spend 50k on revamping a kever and flying to Bulgaria or giving that 50k to a local Moisad so it can stay open? These tzaddikim are rolling in their kevorim. u guys dont get it. he is not saying davening at a kever is wrong. the rov goes to meron. he is talking about rabbonim that take only major donors and promise them untold wishes in return. i was once by reb david abuchazera before rosh hashona. he said to all the frai people standing outside his door. u think because i give u a brocha ur gonna have a good year? the rov id taking issue with the money that is thrown at rabbonim. there aren't enough kevarim in Eretz Yisroel to daven at? The kevarim of these gedolim have more zichuyos that the Kevarim of Avraham, Yitzchok and Yaakov? More than the Ari z'l? It's a big joke and a huge money maker. The sad part is that our enemies, who put million of Jews in their graves throughout Eastern Europe are benefitting the most from these Jewish pilgrams. The chazal say that one can daven and invoke the zichuoyos of anyone from the the avos and imahot, Moshe rabenu, or some arcane rebbe buried in Baluchistan or the Ukraine, without physically standing by the kever. Do they really believe we can be mispallel better standing by the kever than several thousand miles away as long we have the right thoughts and kavanah. NO...the "kever business" is just another way for some rabbonim and their followers to take more money out of the pockets of poor yidden who have been brainwashed to believe that being close to the kever is the best way to get the Ebesheter's attention. “ With our chadarim close to closing and people losing their jobs and homes, the idea that anyone spends money to fly around the world to visit a kever is really pretty corrupt. Do you think the Aybishter would prefer a gvir spend 50k on revamping a kever and flying to Bulgaria or giving that 50k to a local Moisad so it can stay open? u r right nothing more need b said! The lack of emunas Tzaddikim- both tzaddikim of earlier generations and the tzaddikim of today- will be the downfall of the "religious" zionists and the modern "orthodox." 30,000 fools paying a small fortune in airfare and rent for bunkbeds provided by the worst anti-semites, many leaving wives and children alone at home for Yom Tov. All part of today's defintion of frumkeit that values single malt scotch, Thursday night chulent and over-priced human hair wigs above all. A religion based on shtick. Meanwhile our yeshivos can't pay their Rebbeim and frum families go hungry. The rav was speaking about a specific group of people, and it's about time these zionist rabbis start criticizing hypocrisy itself, such as these businessmen are likely guilty of, rather than only criticizing leftists and secularists on principle. That the Israeli press or anyone should laud a bunch of secular businesspeople (whose lives consist of making money, who have no higher value than money and lots of it) simply for saying a few teffilos and saying them before a TV camera at a famous kever, is a bit sickening. Besides, frummies admonish secularists all year long....and suddenly all this outraged response to a rabbi who admonished a few donors for insincerity a bit too close to high holidays? Please. “ EMUNAH!! very simple and at the same time very difficult to accept. "The Torah Says, " Shaal Oveicho veygedch Zicanecha veyomru loch" We are supposed to have faith and Trust in our Rebbeim and be Shoel Aitzeh with them", and that means that we should go to keverim and pray like Catholics to their saints? Sorry, but I don´t agree. I prefer Rambam! And the Neviim who are waiting for Moshiach to awake the dead. Meanwhile, have a git gesindt yur! “ We in NY have many tzaddikim right here. In EY there are many more, the avot and tanoim etc. We do not have to go to Europe and support those who would be thrilled to kill us again. you think you're safe in America ? And going to Europe to go visit Jewish sites isn't support to some antisemitism...if so then all Jews living in Europe would support that too ? You can smell a YNET story smile away. When Calev went to the ma'aros hamachpaela, that was OK because it was in Israel. When Yaakov buried Rochel on the road to Kiryas Arba IN ORDER THAT JEWS SHOULD PRAY AT HER KEVER on the way into exile, that was OK because she was buried in ISRAEL. When tens of Thousand of Jews go to meron to DAVEN by the kever of Reb Shimon (a whole year) or to Tzefas to daven at the kever of the Ari z"l, that Ok because it's in Israel. But Tzaddikim that weren't Zionistic enough to be buried in Israel, it's avoidah zara to pray at those keverim. I would seem to me that those that think we no longer need to pray at the keverim of Tzaddikim because now "we" have a country with an army and and an airforce, with F-16s and Merkava tanks are more closely treading on the boundry on Avoidah Zara than those that are doing what Yidden have done since the time of Chumash. The need of the mizrachist and MO camp to constantly find ways to bash the chareidi camp, often for doing what it says in Shas, Rambam, and shulchan oruch, speaks volumes. "Instead this worshipper of the LAND OF ISRAEL opens his trap to offer opinions about things he knows nothing about"
and I'd add a personnal question : is davening at the koysel idolatry too ? I suppose if I said it's a waste of money to fly to Israel and attend yeshiva or seminary in Israel when it's the SAME TORAH AS IN AMERICA, the Rav would agree that this waste of money on air travel, dorms, and touring expenses is excessive and would be much better spent on preserving the "chadarim that are closing" according to one poster. So where's the Rav's Kol Koray to stay in America and make better use of the money? Oh, his avoidah zara requires you to travel to Israel only and waste money there even the Torah says aniyay ircha kodem, nice. to 11 and 33, you are wrong, the only issur according to some poskim is that it is "simiiar to doresh el hameisim" ("nireh kedoresh el hamesim") see shilchon oruch hilchos erev rosh hasono, no mention of avoide zoro, many poskim disagree and write its perfect ok to speak directly and beg the zaddik (alive or dead) to be mispallel to hasem on your behalf, the sefer mane loshon written by the kadmonim gedoilei Askenaz is based on this shito that it is a heter gomir, its quite amazing that you dont check out the inyen before labelling thousands of yidden as ovdei avoide zoro. Tefilah at kivrei tzadikim goe back a long way. If i remember correctly, Calev davened at Machpelah, the graves of our tzadikim. Rabbi Sherlo, was that also avodah zarah? Are there not enough tragedies out there today???? Can't we can not find room in our hearts and small minds for different shitos in Avodas Hashem. Why all this bashing r'l- yidden are their own worst enemies!! Perhaps the Rav who came out with this statement should ponder a bit. Is the Rav privy to how many yidden who visited kevorim grew in a spiritual sense by observing more mitzvos and increased Torah study (something that can be done privately)..how does he know how the visits to kevorim of tzaddikim affected these particular yidden? Enough disrespect... Unfortunately it takes Rasha and Sonai Yisroel for yidden gain perspective that we are really Am Echad of Hashem Echad who gave us the Torah!! And what is wrong with single malt scotch, Thursday night chulent and human hair wigs? Those who critisize usually do so because Hakadosh Baruch Hu hasn't blessed them with the money needed to buy and enjoy these things. They can't complain about Hakadosh Baruch Hu so they complain about those He has given money to.